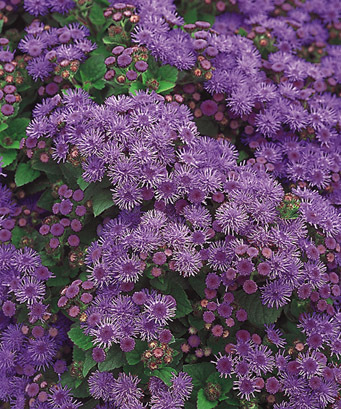 "Wonderful new varieties of ageratum have given this old fashioned favorite new life. Brilliant shades of blue and blue violet along with a dusty mauve rose and white make it a versatile choice for use in beds and borders as well as containers. Taller varieties, such as ‘Blue Horizon’ that reach 2 to 3-feet in height provides summer-long color in perennial gardens and make wonderful cut flowers. Though the plants need deadheading to keep them flowering, the blossoms are extraordinarily long lived, making this an easy care plant for sun and part sun gardens. For an old fashioned border mix blue ageratum with pink begonias and white alyssum. Another easy care combo with a fresh look is dusty miller mixed with blue ageratum and lemon yellow marigolds. Add a few white petunias for a crisp look."